Both collections sound near-identical to their inspirations, and bring a wealth of warmth and character. Recommended! While the three preamps are very accurate emulations of the originals, the addition of the EQs makes these a real must-have. Major new tools for music-for-picture composers. You’ll have to spend time learning how to get the best out of the filters as there are so many possibilities. Whether that’s a pro or con is up to you! 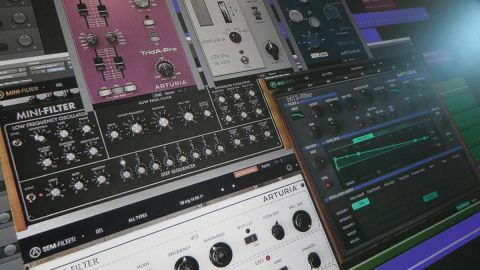 Arturia has a well-earned rep for making incredibly accurate emulations of classic analogue and digital synths using its TAE (True Analogue Emulation) technology. With the 3 Filters You’ll Actually Use pack, it has taken already-proven filter sets from three of the V collection synths and turned them into plugins so you can use them on any sound. With 3 Preamps You’ll Actually Use, it has used that technology to emulate three classic mic pres and their associated EQs. The 3 Preamps package is based on the Neve 1073, the Trident A range and the Telefunken V76. Each has common controls for phase, stereo link, stereo or mid and side operation, input and output, and then there are individual elements exclusive to each. Let’s start with the V73, the classic Rupert Neve transistor design with a few little extras. Where the original had stepped gain and frequency selection controls, here they are continuous and there is also the option to switch between two types of output transformer. Sonically it does what we’d expect. The beautiful curve of the HF is reproduced with all its clarity and the mid and low bands can add plenty of bite and warmth depending on where you set them. Pushing the pre gain can add subtle amounts of punch through to outright distortion. The TridA-pre is a very different beast. Arturia has come up with a very simple and elegant way to MIDI-control its plugs from a controller, and the filters are no exception. You simply click on the MIDI icon on the far right of the toolbar and then all assignable controls are coloured purple. Then it is a simple matter of clicking on the required knob or button, and either moving a knob or clicking a switch on your controller, and it’s assigned. For continuous controls, there are an extra set of parameters you can adjust which come in the form of a minimum/maximum slider. Leave them at 0% and 100% if you want to adjust them over their full range or set a defined range. This is an excellent way of building up highly-controllable patches, particularly helpful in live performance where you want to minimise any margin for error. Once assigned knobs and switches are coloured red and everything’s assigned you can save this configuration. If you have multiple controllers you can save a config for each (or different configs for each) allowing you to switch easily between different configurations of your setup. We love Tridents of this era as we learnt on one and there is a familiarity to the sound of that EQ that takes us back to our younger years: the wonderful interaction between the mid and high and that extra bit of presence you get when you push the gain to the edge of distortion. Think early Bowie and Queen. We love it. The V76 is a very different beast, smooth and creamy with plenty of solid low warmth. Pushing this into distortion and then pulling it back a bit really warms up a thinner signal and adds some lovely harmonic texture. The EQ is less sophisticated than on the other two, more like tone controls (they are simple fixed frequency shelves) but they do have a certain quality to them and are particularly great if something just needs a bit of brightening. Having regularly used all of these devices over the last 35 years we can honestly say that the character of each is very close to the originals. We found ourselves using them in series, pushing some warmth into a sound with the V76 and then adding presence with the TridA, or fattening up drums with a touch of overload and the second transformer on the Neve. We have to agree with Arturia, we will actually use them all. With the filters we have the tonal heart of three classic synths from the V collection range, the Minimoog (Arturia developed their original emulation in collaboration with Bob Moog), the Oberheim SEM and the Oberheim Matrix 12 with some very clever control additions. Each one sounds unbelievably close to the original hardware unit. The Mini-Filter has the classic Minimoog filter with the addition of the drive control which adds warmth at lower settings and distortion at the top of its range. The multi waveform LFO has controls for rate and phase and can affect the filter frequency, emphasis (resonance) and the step sequencer cutoff. The envelope follower has simple attack and decay, and sensitivity to allow dynamics, and it can control cutoff, emphasis and LFO rate, and the 1 to 8 step sequencer will affect the same parameters. The result is an incredibly powerful device, capable of very subtle tonal manipulations to absolute audio obliteration, all with that classic Moog sound. We particularly loved it on electric guitar. Each filter has a different method for modulating, sequencing and re-triggering. The M-12 has three envelope generators, each a mix of envelope, 16-point step sequencer and LFO, and can be looped or triggered/re-triggered by incoming audio. The SEM has a 16-step gate sequencer with separate channels for Envelope and LFO, ie, you can define when the envelope triggers, independently of re-setting the LFO phase. You then assign envelope and LFO to parameters and get anything from a simple note on envelope and LFO trigger to a complex step sequence. The Mini-Filter has the simplest sequencing option with an eight-step sequencer. Each step is either off (at 0) or continuously variable in the positive or negative and then there are continuous controllers for Filter Cutoff, Emphasis and LFO rate. Where the M-12 is the subtle side of Oberheim, the SEM is the upfront elder brother. Here you have the addition of a noise generator and a soft clip function that allows for an injection of extra warmth right through to full-on distortion. The filter mode sweeps continuously from low-pass through band-pass to high-pass, giving you multiple options for brilliant drop effects and build ups. Like the Mini-Filter you get an LFO and an envelope generator but the step sequencer has up to 16 steps and there is a comprehensive modulation matrix for a very detailed level of control. This is a brute with a big sound and plenty of character. These filters are astonishing; they’ll give you tone-altering possibilities you’ve only dreamed of. We see endless hours of fun stretching out before us; we thoroughly recommend you join us.